Responsive Website redesign on the Drupal CMS. Sitemapping and content strategy for multilingual/world-wide audience. 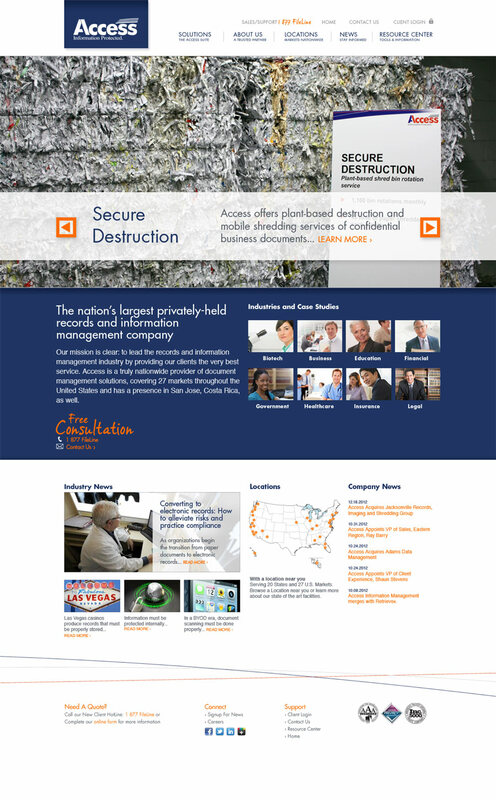 Redesign website branding for a corporate merger. 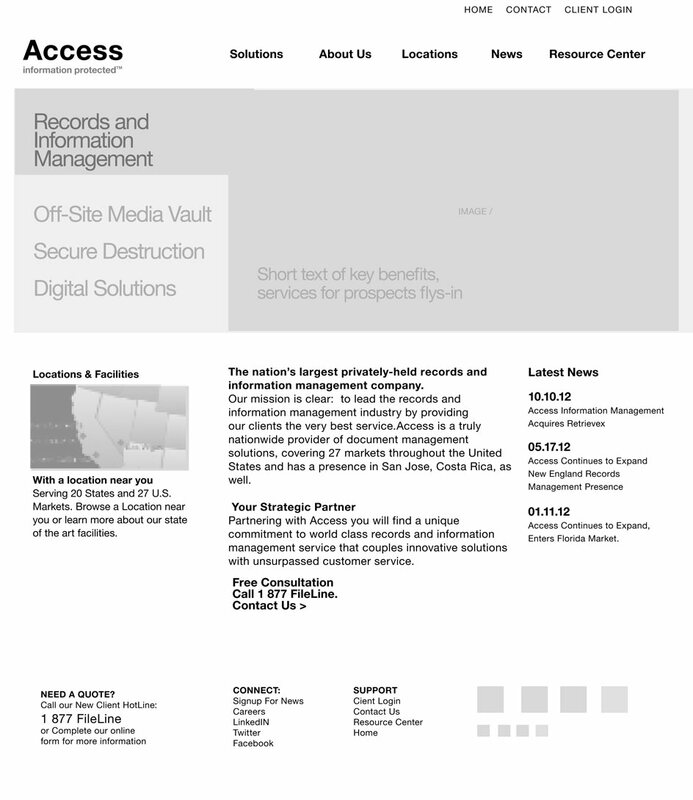 Access Corporation is the largest records storage company in the United States. After acquiring their largest competitor, Access needed a new website that merged the locations and services of both companies and reflected an expanded brand identity. 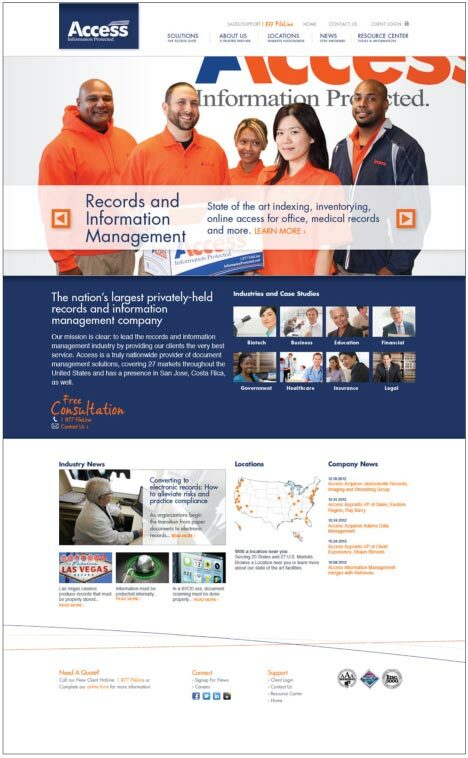 Working closely with teams and stakeholders, Rubic created a new online presence with a mobile-first web strategy. Using sitemaps, protoyping, content strategy tools and user interviews, Rubic helped to merge the company's online content, service offerings, locations and customer contacts. We consolidated login screens and online customer support ticketing forms. Drupal is a flexible solution for managing hundreds of facility locations and provides Access with a flexible tool for future growth. Search Engine Optimization was a must, and Rubic was challenged to devise a solution for managing and repointing hundreds of domain names, landing pages, and pay per click campaigns for the new website. The new digital branding highlights the strength and energy of the new company with intersecting lines, bold typography and well-branded treatment across any device. The new Access website is responsive - it detects a visitor’s mobile device and screen size and adjusts the website’s layout to be easily navigated at that size. Careful attention was given to the Locations section, which provides local points of contact to sales and customer service. 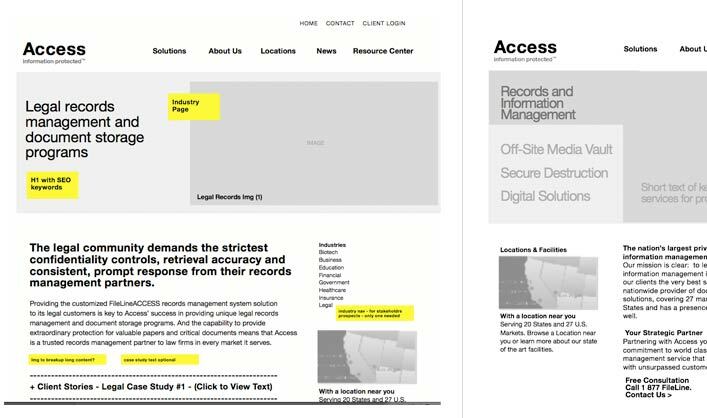 Access continues to manage and grow their online presence using the Drupal CMS in-house.